If you want to get the most of your visit to the Vendée, there is no better way than by cycling or walking. One can discover the hidden treasures that only a leisurely pace will reveal. 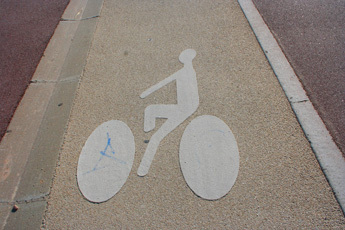 Within the Vendée a vast network of cycle tracks can be found, these have been designed for riding in complete safety while taking in the natural attractions that Vendée has to offer. There are over 1000 kilometres of tracks so now you can take a complete cycle tour of the Vendée. On the tracks everything has been put in place for maximum safety including designated cycle lanes and all the necessary signposts. One will also find excellent picnic areas along the route for relaxing and refreshing oneself. The Department of the Vendée has published "Les Sentiers Cyclables de la Vendée" these are 66 routes of various lengths that form the core of the marked routes around the whole Department. 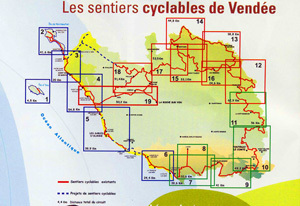 Les Sentiers Cyclables de la Vendée can be obtained from any local tourist office. The routes are in three distinct areas, the coastal routes, the routes of the marais poitevin including the south Vendée and the routes of the Haut Bocage. The Coastal Sentiers run along 285 kilometres of coastline and one will find direct access to the beaches, from these tracks. One can also admire the fascinating scenery of dunes, rocky coastline, the seaside resorts and the marshlands that make up the coastal landscape. The Sentiers of the Marais Poitevin have 200 kilometres of cycle tracks which will take one from the coastal town of l'Aiguillon-sur-Mer through the polders and marshlands around the Baie de l'Aiguillon before entering the upper reaches of the Marais Poitevin or Green Venice travelling along canal towpaths with subtle changes in the landscape at every turn. The route then turns northward through the Mervent forest and Vouvant, taking a detour around Faymoreau. Its northerly journey then takes one via La Chataigneraie, Cheffois and Reaumur, before giving way to the Sentiers of the Haute Bocage. The Sentiers of the Haute Bocage have 280 kilometres of marked track and uses quiet agricultural roads and paths which take one into the heart of countryside. The route even includes 27 kilometres of old railway track, so the going here is relatively easy. There are many detours from the circuit before one arrives back on the coast. The Sentiers are the marked routes, but of course one is free to choose one’s own routes. Perhaps you will take a mixture, using parts of the marked routes but varying to stop off at the many interesting places and attractions that this area has to offer. We hope to reproduce all 70 routes as interactive maps in the near future, this will involve a considerable amount of work so may take a little while. If you want to get the most of your visit to the Vendée, there is no better way than by cycling or walking. One can discover the hidden treasures that only a leisurely pace will reveal. Within the Vendée a vast network of cycle tracks can be found, these have been designed for riding in complete safety while taking in the natural attractions that Vendée has to offer. There are over 1000 kilometres of tracks you can take a complete cycle tour of the Vendée. On the tracks everything has been put in place for maximum safety including designated cycle lanes and all the necessary signposts. One will also find excellent picnic areas along the route for relaxing and refreshing oneself.